The Base Community Hub, which launched in October 2018 following Rotherham Borough Council's decision to close Oaks Day Centre, Wath, earlier in the year, promotes and facilitates learning, social interaction, sports and work experience for young adults with Autism and mild-moderate learning difficulties. 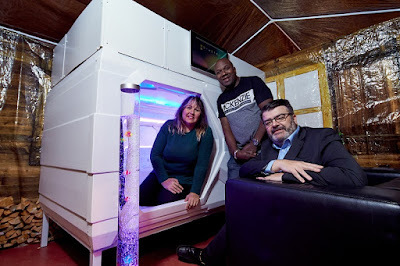 Supported by a £500 grant from the UK Steel Enterprise Kickstart Fund, business owners Michelle Harris and Anthony Wilson are delighted to have the centre as the flagship location for a brand new, high-tech Sensory Box which was developed in China and supplied by Paul Robinson of Ego-Podzone. The Box, which is the first of its kind in the UK, fully equipped with air conditioning, colour changing lights, an LED interactive screen and a plush interior, is a fully adaptable environment that facilitates well-being and relaxation, allowing users to tailor the space to their own requirements. Michelle Harris, co-founder of The Base Community Hub, said: "Following the closure of a number of day centres in and around the area, there was a growing need to offer alternative activities for adults with learning difficulties. "At The Base Community Hub, users can benefit from tailor made packages that encompass learning, social activities as well as general well-being. "Coming from a background in Design Engineering, my goals has always been to bring STEM learning to disabled children and, with both myself and Anthony being qualified English Athletics Coaches, we wanted to incorporate fitness into the schedule as part of a wider push for well-being and social interaction." Currently a core team of two with a number of volunteers in training to support the running of the activities, The Base Community Hub are looking to expand the team and are planning to take on a further four members of staff in the New Year. UK Steel Enterprise is a wholly owned subsidiary of Tata Steel. Its Kickstart Fund provides grants of up to £500 to start-up businesses to purchase essential equipment and or services that can get them trading. Alan Stanley from UKSE (pictured, right), said: "It goes without saying that Michelle and Anthony are providing a much needed service for the area and it's amazing to hear that The Base Community Hub is the flagship location for the Sensory Box! "Our Kickstart grant scheme is designed to support the growth potential of budding entrepreneurs and their businesses and it's been a pleasure to support such a crucial facility that I'm sure many people will benefit from for years to come." Great news about The Base!